Since there are no directly available 5G devices as of now in the US, so all the 5G developments for faster connectivity is being controlled by mobile hotspots. What these hotspots do is they convert the high-speed 5G signal into another form of transferrable Wifi signal. Any Wifi enabled device if allowed, can directly connect to these hotspots and enjoy seaming high-speed 5G internet. 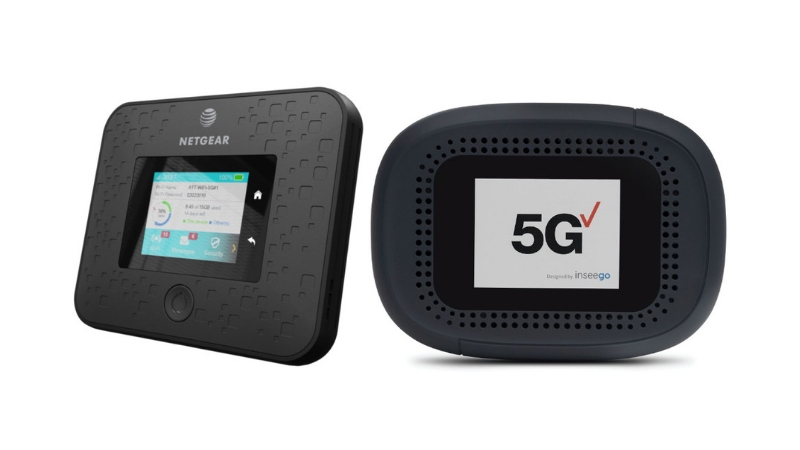 Recently at the Qualcomm Snapdragon Summit, Netgear and Inseego both had their versions of 5G mobile hotspots for display. The Netgear 5G mobile hotspot or more accurately the Netgear Nighthawk 5G Mobile Hotspot is a small black box with a small LCD screen. What the screen display, we don’t know yet. Inside this device, there is the latest Snapdragon X50 modem along with the Snapdragon 855 Soc which makes it possible for the device to receive 5G signals. The X50 alone cannot function; it needs the Snapdragon 855 for the control logic. Now for output to other devices, the device has a built-in 802.11ac/ax. On top of it all, it also has a USB 3.1 Gen 1 for an output of around 5Gbps. And to power it all there is a battery inside, but the specifications for the battery are not yet disclosed. Now as far pricing is concerned, AT&T will have it revealed within the Q2 of 2019. Facing up with AT&T is Verizon with their mobile hotspot from Inseego. At the Summit, Verizon gave a demo of the device, which clearly showed the unit functioning and taking data independently for distribution. Similar to the Nighthawk, the incoming 5G signals here too are converted into a Wifi network that anyone nearby can use. Now as far hardware and connectivity are concerned, we get the same setup of Snapdragon X50 modem, Snapdragon 855 SoC and a 4400 mAh battery. This device has a basic built-in 802.11ax along with an Ethernet RJ-45 port. There is also a type-C port for direct tethering connectivity. And similar to the nighthawk, here too we get a small LCD to change settings regarding connectivity. The 4400 mAh battery is said to have a 10 hour backup for now, but the company revealed that they are planning to make it last an entire day at least. There are still a lot of optimisations to do to support a speed of upto 2Gbps of 5 connectivity with a sub-10-millisecond latency which might encourage a lot of online gamers to go for it in the first place. Verizon will be the one to put it in the market, but the details regarding price and availability are not yet revealed. As far per the latest rumours, we can expect to get information on the pricing of the device and even see it in the markets by the end of the year 2019. He is a tech enthusiast who loves writing on various topics related to the field of technology. He is also a web designer and a good programmer. Here he brings the latest news on 5G mobile phones.